QUESTION: Mark, I have an old shower alcove area that I am planning to re-tile. After removing the shower tile and cement backerboard I see that the shower framing is in very rough shape. The base of the shower frame is actually rotted out. Can you provide me with some tips on how to build custom shower walls? Any advice on how to properly frame shower walls would be greatly appreciated. Also, I would really appreciate it if you could explain in detail how to build custom shower walls near the top of the bathroom ceiling. I am not sure how I would tie the shower walls into the bathroom ceiling. Thanks in advance, Larry. 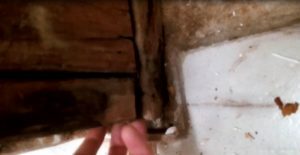 ANSWER: Larry, based on the video you sent me I would suggest ripping out all of the framing around the shower/tub area and re-framing it, if you want to ensure a leak free ceramic tile shower. Re-framing it is not that difficult. Building custom shower walls is fairly easy. You could do it in a few hours of work. The bottom plate looks so rotted and flimsy that I would be concerned about the rigidity of the shower pan. 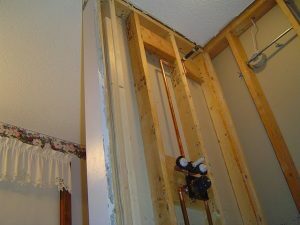 See my article on framing shower walls for a custom shower. In regards to your question on how to tie in the shower walls near the bathroom ceiling; As you can see in the nearby picture, there is a top plate using 2x4s that is nailed/screwed to the bathroom ceiling. The top 2×4 plates are fastened tightly into ceiling joists above the drywall ceiling. You may need to go into your attic, if you have an attic to go into, to locate where the ceiling joists are. You may also need to, or want to, add more blocking (2x4s or 2x6s) between the ceiling joists, so that you can more easily attach the top plates in the shower alcove area, particularly if the ceiling joists are running parallel to the bathroom shower walls. I would recommend using screws for fastening this frame work (top plates) so that you don’t crack drywall in adjacent rooms or in the ceiling. Once you have the top and bottom plates framed/fastened in place, you can then cut vertical wall studs and fasten them in place to the top and bottom plates. Use either a nail gun or long screws if you need to protect adjacent drywall’ed walls. Also note in the corners of the alcove to place wall studs so that you have solid corners to attach the cement backerboard or Hardie backerboard to. One final tip. Toe nail/screw the vertical studs in place on their flat sides, and make sure that if you toe nail/screw from the front outer edges for any reason, that they are flush with the wood. Otherwise the backboard won’t lay flush up against the stud.